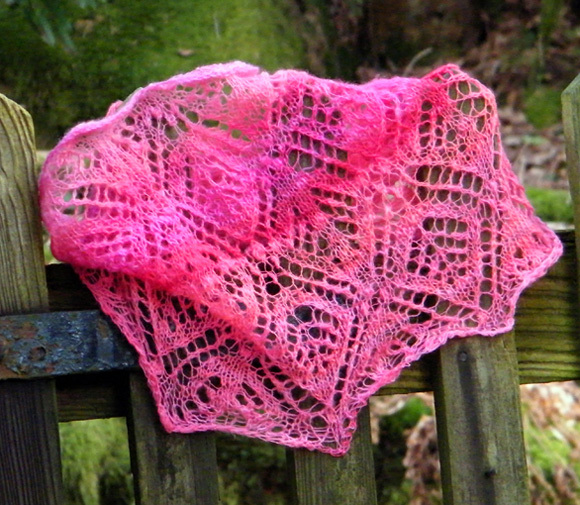 I love single-ply lace, and, as a beginning spinner, made it my ambitious mission to come up with a skein of my own. I only had the patience for about 300 yards of the super-thin pink stuff, but it was just the right amount for a lacy Estonian-inspired cowl. And dipping the finished yarn alternately between hot and cold baths during setting made sure it would all stay together. I spun it on my drop spindle as I unfortunately don't yet have a wheel. There's also something extremely satisfying about making very thin yarn on a drop spindle, and I enjoy the rhythm of it. My drop spindle is very light (18g) so can handle spinning thin singles very well as long as the staple length is long enough, and I spun it so it ended up still soft spun, quite a bit like Malabrigo Lace. It was definitely a learning experience and really resulted in my first usable handspun yarn, and I'm quite proud that it turned out so well. I must say that this project has made me a spinning convert, and I foresee many hand-spun items (and a wheel!) in my future. Experiment with chopping and changing colors in hand-dyed roving to create a flash of self-striping pattern. If nupps and hand-spun, singly-ply yarn (understandably) scare you, why not add a scattering of beads instead? The stitch pattern used in the cowl is a classic Estonian pattern called Spruce and Diamond, and “Kuusk” is Estonian for spruce. It’s pronounced, roughly, “koosk”, but with an alluring Scandinavian spin. 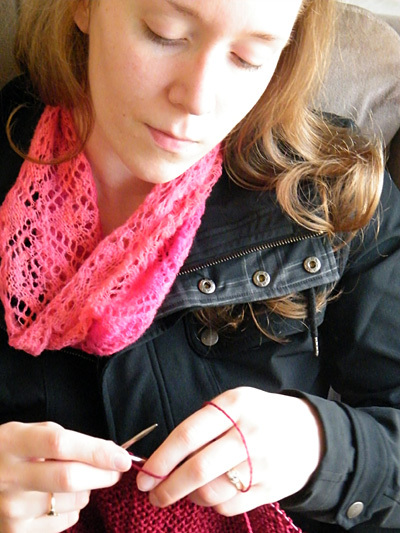 To adjust length, simply work more repeats of the Lace Pattern. Each additional repeat requires about 100yds of yarn, and will add about 4 inches in length. Nupp: Work (k1, yo, k1, yo, k1) into next st. On the next rnd, you will knit these 5 sts together. Worked over a multiple of 20 sts. Rnd 1: [Ssk, p2, k3, p2, yo, k1, yo, p2, k3, p2, k2tog, k1] to end of rnd. Rnd 2: [Ssk, p1, k3, p2, yo, k3, yo, p2, k3, p1, k2tog, k1] to end of rnd. Rnd 3: [Ssk, k3, p2, yo, k5, yo, p2, k3, k2tog, k1] to end of rnd. Rnd 4: [Ssk, k2, p2, yo, k3, nupp, k3, yo, p2, k2, k2tog, k1] to end of rnd. Rnd 5: [K3, p2, k4, k5tog, k4, p2, k4] to end of rnd. Rnd 1: [K2, (yo, ssk) twice, k2, nupp, k1, nupp, k2, (k2tog, yo) twice, k3] to end of rnd. Rnd 2: [K8, k5tog, k1, k5tog, k9] to end of rnd. Rnd 3: [K1, (yo, ssk) twice, k1, k2tog, yo, k1, nupp, k1, yo, ssk, k1, (k2tog, yo) twice, k2] to end of rnd. Rnd 4: [K9, k5tog, k10] to end of rnd. Rnd 5: [K2, yo, ssk, k1, (k2tog, yo) twice, k1, (yo, ssk) twice, k1, k2tog, yo, k3] to end of rnd. Rnd 7: [K1, yo, ssk, k1, (k2tog, yo) twice, k3, (yo, ssk) twice, k1, k2tog, yo, k2] to end of rnd. Rnd 9: [K3, (k2tog, yo) twice, k5, (yo, ssk) twice, k4] to end of rnd. Rnd 11: [K2, (k2tog, yo) twice, k7, (yo, ssk) twice, k3] to end of rnd. Rnd 13: [K1, (k2tog, yo) twice, k2, k2tog, yo, k1, yo, ssk, k2, (yo, ssk) twice, k2] to end of rnd. Rnd 15: [(K2tog, yo) twice, k2, k2tog, yo, k3, yo, ssk, k2, (yo, ssk) twice, k1] to end of rnd. Rnd 17: [K1, k2tog, yo, k2, (k2tog, yo) twice, k1, (yo, ssk) twice, k2, yo, ssk, k1, nupp] to end of rnd. Rnd 18: [K19, k5tog] to end of rnd. Rnd 19: [Nupp, k3, (k2tog, yo) twice, k3, (yo, ssk) twice, k3, nupp, k1] to end of rnd. Rnd 20: [K5tog, k17, k5tog, k1] to end of rnd. Rnd 21: [K2, yo, ssk, k1, (k2tog, yo) twice, k1, (yo, ssk) twice, k1, k2tog, yo, k2, nupp] to end of rnd. Rnd 22: [K19, k5tog] to end of rnd. Rnd 23: [K1, (yo, ssk) twice, k1, k2tog, yo, k3, yo, ssk, k1, (k2tog, yo) twice, k2] to end of rnd. Rnd 25: [K2, (yo, ssk) twice, k1, k2tog, yo, k1, yo, ssk, k1, (k2tog, yo) twice, k3] to end of rnd. Rnd 27: [K3, (yo, ssk) twice, k5, (k2tog, yo) twice, k4] to end of rnd. Rnd 29: [K4, (yo, ssk) twice, k3, (k2tog, yo) twice, k5] to end of rnd. Rnd 31: [K1, yo, ssk, k2, (yo, ssk) twice, k1, (k2tog, yo) twice, k2, k2tog, yo, k2] to end of rnd. Rnd 33: [K2, yo, ssk, k2, yo, ssk, yo,sk2po, yo, k2tog, yo, k2, k2tog, yo, k3] to end of rnd. Rnd 35: [K1, (yo, ssk) twice, k4, nupp, k4, (k2tog, yo) twice, k2] to end of rnd. Rnd 36: [K9, k5tog, k10] to end of rnd. Rnd 1: [Ssk, p2, k1, yo, k9, yo, k1, p2, k2tog, k1] to end of rnd. Rnd 2: [Ssk, p1, k2, p1, yo, k7, yo, p1, k2, p1, k2tog, k1] to end of rnd. Rnd 3: [Ssk, k2, p2, k1, yo, k5, yo, k1, p2, k2, k2tog, k1] to end of rnd. Rnd 4: [Ssk, k1, p2, k2, p1, yo, k3, yo, p1, k2, p2, k1, k2tog, k1] to end of rnd. Rnd 5: [Ssk, p2, k2, p2, (k1, yo) twice, k1, p2, k2, p2, k2tog, k1] to end of rnd. CO 120 sts, place marker and join to work in the round, being careful not to twist. 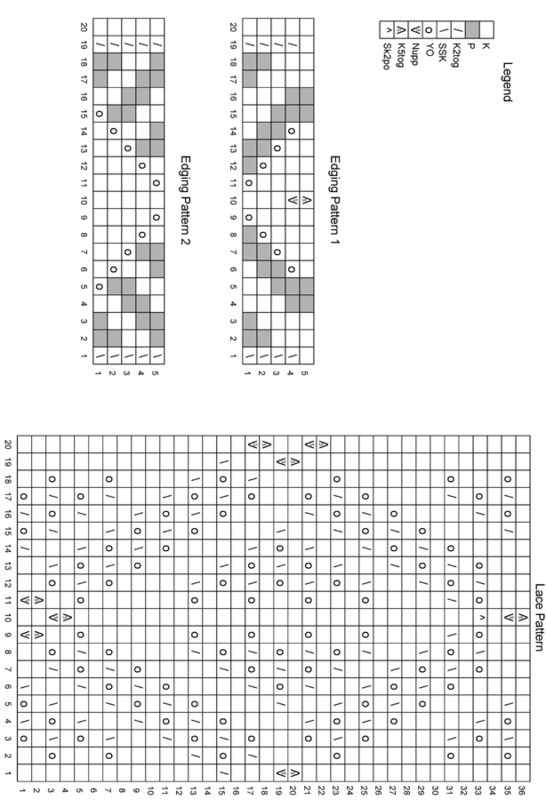 Work Rnds 1-5 of Edging Pattern 1 once, using written or charted instructions as you prefer. Work Rnds 1-36 of Lace Pattern twice, or as many times as desired, using written or charted instructions as you prefer. Work Rnds 1-5 of Edging Pattern 2 once, using written or charted instructions as you prefer. K1, *k1, sl 2 sts back to LH needle and k2tog] until 1 st rem. 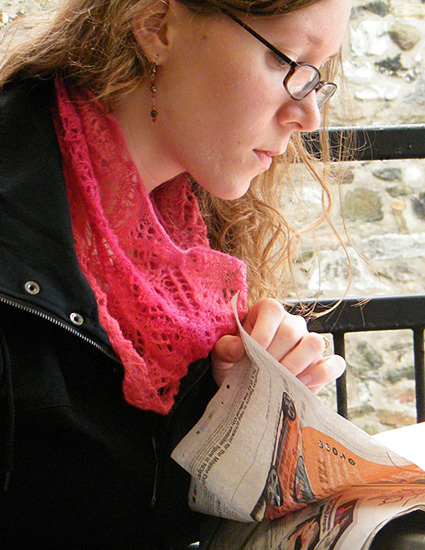 Cut yarn and draw through final st.
Block cowl, opening up lace pattern and exaggerating scallops for edging. Weave in ends. 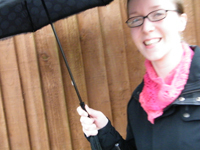 Ashley is an American ex-pat who designs, edits, writes, cycles, and knits from a bungalow in a beautiful, sheep-filled corner of Wales. Find her on Ravelry as Wonk, or her designer profile here.